LAS VEGAS – Once again, Las Vegas maintains its long-standing reputation as the leading destination for business travel. For the 25th consecutive year, Las Vegas was named the country’s No. 1 trade show destination according to the Trade Show News Network (TSNN) “2018 TSNN Top Trade Shows” list. According to the list, Las Vegas hosted 48 of the largest shows held in the country last year. The coveted list by TSNN represents the largest trade shows held in the country each year, ranked by net square footage. According to TSNN’s rankings, CES 2018 secured the top spot with nearly 2.8 million net sq. ft., of exhibit space spanning the Las Vegas Convention Center and several additional facilities throughout the destination. Orlando and Chicago tied for second place on this year’s list, followed by Atlanta at No. 3 and New York at No. 4. To see the full TSNN list, visit http://www.tsnn.com/toplists-us. "Once again, Las Vegas has topped the 2018 Top Trade Shows list with more than double the amount of shows represented than the next city on the list," said Rachel Wimberly, EVP of Business Development, Tarsus US (TSNN's parent company). "With so much new convention and meeting space, more hotel rooms and exciting entertainment and dining options coming online in Las Vegas, there's no doubt the city will be hard to beat in the near future." 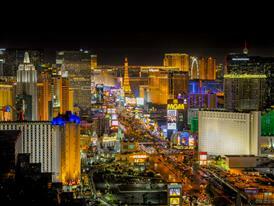 The LVCVA is committed to maintaining the destination’s top spot on TSNN’s list. The Las Vegas Convention Center District (LVCCD) project is well underway, and is slated for completion at the end of 2020 in time for CES 2021. The project will add 600,000 square feet of exhibit space, new meeting rooms and other amenities, as well as renovating the entire existing property. Additionally, the LVCVA Board of Directors recently approved a recommendation to select Elon Musk’s The Boring Company to design, construct and operate a people mover for the Las Vegas Convention Center via a loop of underground express-route tunnels that could carry passengers in autonomous electric vehicles at high speeds. This LVCCD project will continue to cement Las Vegas as North America’s premier business destination, allowing shows to grow in both square footage and attendance. In addition to the landmark LVCCD project, confidence in this industry sector is supported by billions of dollars in destination-wide investment, including the addition of more than three million square feet of exhibit space in the next five years. Many Las Vegas properties are incorporating new and unique health and wellness offerings catering to business travelers. Examples include, healthy dining options, guided meditation, state-of-the-art lighting and air purification systems.